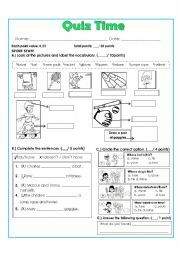 Students will have four options to choose the right Demonstrative Pronouns. They also have to color accoding to the statement. 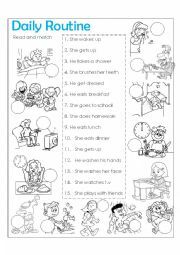 Students will read and match according to the pictures using the present simple. Also, the exercise will make emphasis on the use of the third person. 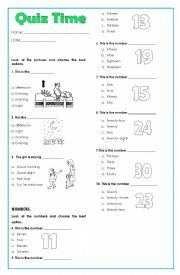 Students will organize the sequence of daily activities during the day. Also, they will identify the vocabulary of the main three mails we have duriung the day. You can change it according to the students levels and abilities. 1. 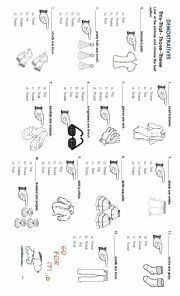 Students will read and identify clothing �tems. 2. 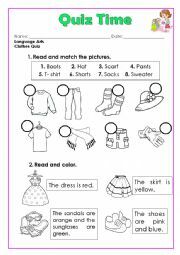 Students will read and color clothing �tems. 1. Students will recognize sports stuff. 2. Students will use the correct form of has/have. 3. Students use whose plus possessive pronouns. 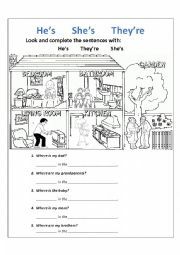 Students will complete the sentences using the present simple. The first example is given. 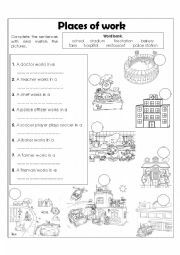 Student will complete the sentences with the word bank and match them to the pictures. Students will choose the best answer according to the picture. Students will read and choose the best description for the monster.